In addition to liberating the document dump pertaining to the Internet dragnet program. (See my working threads: one, two, three, four, five. ), EPIC has been fighting several other parts of the FOIA for the PRTT documentation to Congress. I’m going to have three more posts on these materials. This post will comment on the reports to Congress, all of which (except the December 2006 one, which I’ll ask them to fix) are available here. Here’s a summary of the changes from report to report. Throughout this reporting requirement, DOJ has been obligated to include the number of US persons targeted. How it has done so has varied by period. Here’s how it breaks out by reporting period (I’m doing it this way so we can match it up to known techniques). January 2005 through June 2006: Orders include a definition of aggregate that includes corporations and other non-individual legal persons, these orders provided an “at least” aggregate number (with a footnote explaining why that is redacted). This method covers most of the reports during the “combined” period. Update: The DOJ IG Report on Section 215 use in 2006 may explain some of this: for 215 orders in this period, FBI did not count the requested records of non-subjects, which would likely apply to combined orders. July 2006 through December 2006: This report includes no discernible US person breakout. January 2007 through June 2008: These reports used an “at least” number to count US persons. July 2008 through June 2010:This period included exact numbers for USP targets, and also no longer includes modifications (which often are minimization procedures). July 2010 through December 2012: This period uses “named US persons” as a reporting category, and to the extent it’s relevant, breaks out the NSA orders. Note, some of the differential reporting (such as the “aggregate” language for the period before Congress got briefed on the bulk PRTT) to be get around informing Congress of certain collections. Some–such as the apparently still-current “named USP” suggests there’s a lot of incidental collection the government doesn’t count (which would be likely in the use of stingrays, though the prior use of target could be done there too). Note the variation in agencies named, with PRTT being listed as FBI only, then being listed as NSA and FBI, then all government, then both again, and finally, broken out by agency. This likely stems most significantly from efforts to hide that they were using PRTT for the dragnet, then incorporation of NSA into the FBI dragnet numbers. 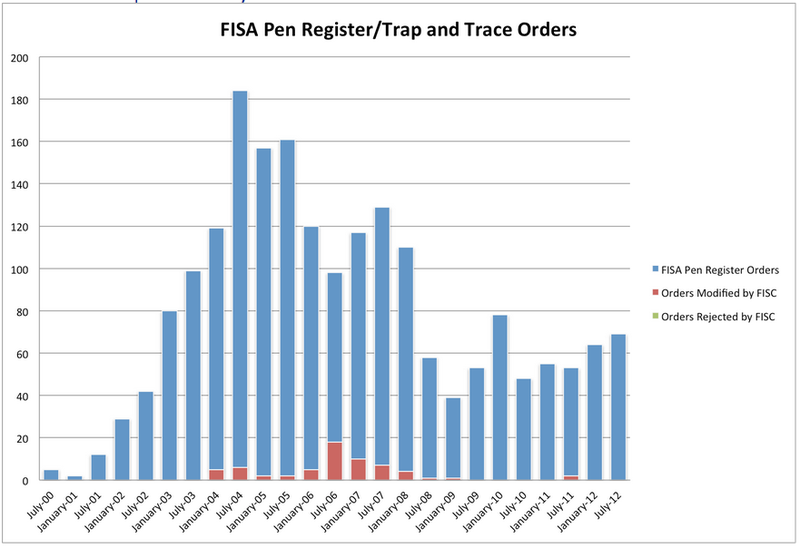 The NSA numbers first get broken out for the December 2010 report, with a statement there were no NSA applications in the first half of 2010. That accords with the understanding that the Internet dragnet got shut down around October 30, 2009, then Bates approved it again in July 2010 (which would be the partial declination marked). I was interested that John Ashcroft didn’t a bunch of reports during a period when DOJ provided narratives of the Americans targeted. Also, for the first few periods of Stellar Wind, the signee was not read into Stellar Wind. I’ve increasingly noticed AGs having someone else sign something as a workaround, and that may have been true here, too (remember that the government was obtaining Internet metadata even before Stellar Wind). But then, to the extent we still got transmittal letters (they stopped entirely in June 2007), they were signed by the Congressional Liaison. No, this is simply a criminal conspiracy to dupe the stupid rubes in Congress and the American public. Meanwhile, the illegal surveillance conspiracy continues. Efforts to hide that they were using PRTT for the dragnet. un hun. Well, as Clapper would say… not wittingly. Not. If the “rule of law” actually existed…every single liar in the IC would be in prison. Unfortunately..it’s only a myth. This is why America is the Dumbest Country on the Planet and the reason prosecutor Robert McCulloch got away with the absurd Grand Jury decision…notwithstanding the NSA’s usurpation of the 4th Amendment…continuous war…torture… the police state murder of citizens… and on and on and on.